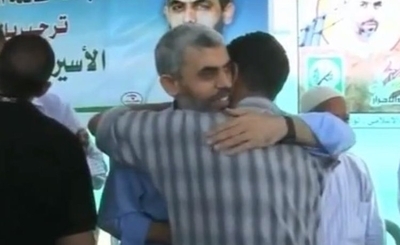 The election of Yehya Sinwar to lead Hamas in Gaza represents the completion of a lengthy takeover by the terror movement's military wing at the expense of the political wing, and it could signal a more imminent confrontational path with Israel than previously thought. The Izzadin Al-Kassam Brigades gradually have been pushing aside Hamas's political wing, seeing it as an impediment to its jihadist war efforts against Israel. Sinwar and his military wing comrades want to reestablish their alliance with Iran and boost a tactical partnership with ISIS in the Sinai Peninsula. His rise likely means that Hamas and Iran will grow close once again, after years of turmoil over their opposing stances on the Syrian war. In fact, Sinwar's rise to power is being described by veteran analyst Pinhas Inbari as Iran's taking back the reigns to Gaza, which stemmed from Iranian concerns over a more hardline policy from the United States after President Donald Trump's election. Inbari does not believe Sinwar's appointment was even based on elections, saying the results came from pressure by Hamas's military wing on the political wing, and that the development is "Iran's way of conveying a message before the Trump-Netanyahu talks" that took place Wednesday. Sinwar, who served 22 years in an Israeli prison for murdering Palestinians he accused of being Israeli collaborators, is a trigger-happy senior Hamas member who does not hesitate to shoot dead Gazans he perceives as being disloyal. He was released from prison during the 2011 Schalit prisoner swap with Israel, and quickly rejoined his comrades in the military wing, under the command of Muhammad Def, who were feverishly preparing rocket attacks, and tunneling into Israel. Sinwar ordered the execution a year ago of a Gaza City Hamas battalion commander, Mahmoud Eshtwi, who was seen as being too open and critical towards his superiors. According to a recent report by Israel's Coordinator of Government Activities in the Territories, Sinwar and his brutal track record are associated with an end to the "ijma" (consensus) manner in which Hamas once made strategic decisions, and the beginning of an internal Hamas dictatorship. That could spell trouble for the Palestinian Authority, which Sinwar views as a foe, and which Hamas continuously seeks to topple in the West Bank. It could spell problems for Hamas's other neighbors as well, like Egypt and Jordan, both of which have their own domestic Islamist and jihadist problems. Brutal murders of any who fail to toe the party line under Sinwar could turn into a violent routine throughout the Gaza Strip, the Coordinator of Government Activities in the Territories report said. Traditionally, Hamas's Shura Council included the military and political wings as well as the Hamas overseas politburo. Ismael Haniyeh – Sinwar's predecessor – moves into this position formerly held by Khaled Mashaal. One of his key goals is to apply the idea that the military wing spent too much time listening to the political wing, leading to a failure in achievements against Israel. Sinwar did not consult with the political wing before having the Gaza City battalion commander murdered and he will likely not consult with it when he moves to establish closer bonds with Tehran. And yet, even an extreme a figure as Sinwar will have to take reality into account when it comes to his options against Israel. Since the end of the 2014 conflict with Israel, it seems reasonable to assume that the Israel Defense Forces (IDF) may be working on a new combat doctrine together with the Shin Bet domestic intelligence agency against the terrorist regime in Gaza. If such a change has occurred in the Israeli defense establishment, in the event of a new conflict, Israel could seek to destroy the military wing. That would be a dramatic shift from the older goals of containment and deterrence. This potential change in doctrine may have been hinted at in comments made on occasion by Defense Minister Avigdor Liberman, who said, for example, last year, that Israel would destroy Hamas "completely" in the next war, though Jerusalem would not be the one to initiate hostilities. The old rules, by which Hamas could initiate controlled escalations, and was free to deescalate when it accomplished its goals, appear to be gone, and it's reasonable to assume Sinwar is aware of the risks to his regime. Israel's recent breakthroughs in tunnel detection capabilities, precision air power, and revamping of the Armored Corps, together with enhanced ground forces combat training, all mean that a mistake by Sinwar could prove to be the most costly to date for Hamas in Gaza. Yaakov Lappin is a military and strategic affairs correspondent. He also conducts research and analysis for defense think tanks, and is the Israel correspondent for IHS Jane's Defense Weekly. His book, The Virtual Caliphate, explores the online jihadist presence.